Fostering International understanding is an important aspect of our service in Inner Wheel. Many of us will be hosting guests from overseas, hearing speakers or visiting charity projects abroad. Our service also includes providing help for those in great need, whether in developing countries or in areas which have suffered because of war or natural disaster. This is a newly formed charity whose aim is to give women and girls in India comfort, dignity and freedom, by enabling females of all ages to fulfil their potential by ending period poverty, Having periods is the most natural thing in the world but in some places this natural process means that girls miss days from school each month and often drop out of school altogether and women often stay at home and lose work days. Many women and girls resort to using rags, leaves and in some cases soil. This isn’t right and this charity is doing something about it and they need our help. The provision of Saafkins, a culturally and geographically sensitive solution is already helping many to become healthier, happier and free to fulfil their potential. What is a Saafkin? 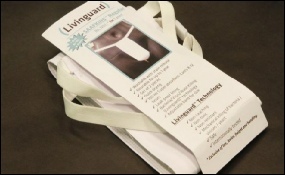 It consists of a washable pad made from anti bacterial fabric which enables it to be washed even in unclean water and this is attached to a belt. £5.00 will provide a woman with a year’s supply of these saffkins. The District International Service committee hopes to inspire each club to organise some imaginative fundraising in the coming year towards this worthwhile charity. An alternative product is in the process of being manufactured. It is also an anti bacterial product but is a self cleaning pad. Prices and distribution costs are being discussed and it is hoped that this product will prove more suitable for those women living in slums. Our annual International Service Rally and Tea will be held on 16th May 2019 in Benson Parish Hall. 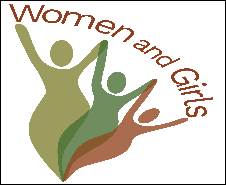 The founder of ‘Women and Girls’ will speak to us about their work at this event. 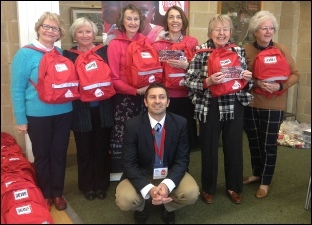 In February 2016 we had a District day of Service to pack items in bags for School in a Bag, the chosen charity for 2015/16. 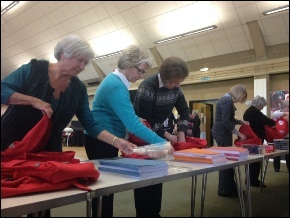 Members from all over the District came to Benson Parish Hall with a packed lunch and enjoyed the friendship and fun of working together and giving ‘hands on’ service to our chosen charity. 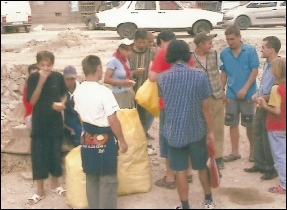 Donations of spectacles and stamps are needed for other International charities. 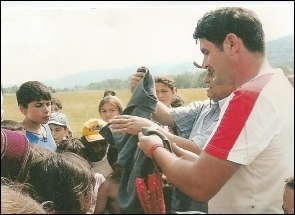 We will continue to support the ongoing work of BEKIND, a small charity working with street children in Eastern Europe, with donations of children’s clothes, school stationery, toiletries and blankets.